This article originally appeared in the October 2017 issue of ARBORIST NEWS, a publication of International Society of Arboriculture (isa-arbor.com). This content is reprinted with full permission of the publisher. In the last Simply Safe article on tree risk assessment (August 2017, pp. 64–65), I discussed the similarities between conducting a thorough, systematic, pre-trip vehicle inspection, and conducting a pre-work tree risk assessment. The conversation focused on how following a systematic process while performing a pre-work tree risk assessment reduces the likelihood of missing critical points of concern. This follow-up article emphasizes the importance of correctly identifying decay fungi, whenever possible, as part of the pre-work tree risk assessment. There are levels of priority in the inspection process, often based on likelihood and consequences. During a pre-trip vehicle inspection, for example, although we may check the tire pressure and the tread depth, we likely place a higher priority on checking the seatbelt, the steering linkage, and making sure the brakes are working. Now, the consequences of having a tire with low pressure or shallow tread depth are significant, but those consequences are likely lower in severity than the consequences of possessing a faulty seat belt, steering linkage, or brakes. A systematic tree risk assessment is very similar. 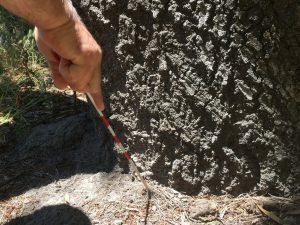 In an assessment, one inspects the whole tree, but the likelihood and/or consequences of failure for a trunk with a significant defect may be higher than the likelihood/consequences of a wrist-sized limb with a similar defect in the outer canopy. For this reason, after observing the tree from a distance for obvious points of concern, it is good to inspect the tree parts that could contribute to whole-tree failure and severe consequences, if they should fail. One of the biggest concerns regarding root health (and associated tree stability) is decay. You can use a blunt-tip probe while inspecting the trunk flare to check for symptoms, such as soft, decayed roots just below the soil surface. You can start by inspecting the area around the trunk. This will give you an idea of how sound the roots are and help you determine if they are buried under backfill. You should also look for signs of decay fungi, but be aware that the visible signs of some important decay fungi are not present yearlong. The most common indicators of fungi are fruiting structures, commonly referred to as mushrooms, conks, and brackets. Visible fruiting structures are typically only a small part of the whole fungal organism that is decaying the wood. A simple way to visualize this is to think about the flowers of a tree; the flowers are a reproductive structure, just as the conks, mushrooms, and brackets are the reproductive structures of fungi. Identifying fungi from visible fruiting structures can be difficult. Some fungi, such as Ganoderma applanatum, have perennial fruiting structures that are visible throughout the year, even when the fungi is dormant. Many fungi, however, have fruiting structures that are present for only a short period before drying up and subsequently degrading. Fungal fruiting structures can be useful to positively identify fungi, but the chance of conducting your tree risk assessment when the fruiting structures are present and identifiable may be relatively low. Being able to identify fungal fruiting structures is an important skill. And while most qualified arborists are good at identifying common species of trees in their area, there are fewer arborists who are able to identify the key decay fungi affecting those trees. You can use a blunt-tip probe to check for symptoms of decay, such as soft, decayed roots just below the soil surface. Arborists should be knowledgeable of how fungi decay wood. Some species are more aggressive than others and will degrade the structural integrity of the tree faster. 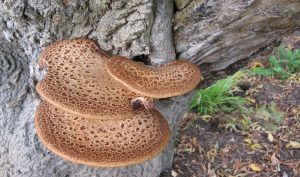 If you are speaking with a client who says, “I’ve seen that same mushroom on that tree trunk for several years,” then your response will likely be different for a less-aggressive white rot species (e.g., Polyporus squamosus), than if the fruiting structure were an aggressive brown rot species (e.g., Laetiporus sulphureus). Brown rot and white rot fungi significantly change the characteristics of the wood in different ways. Doing your research and knowing the facts—knowing those characteristics—will help you better determine how to safely work on the tree. Performing a pre-work risk assessment on every tree one works on is essential, regardless of whether that tree will being climbed, accessed from an aerial lift, or worked on from the ground. Follow a systematic process that you can easily repeat on every tree you assess. This will ensure your assessment becomes routine, and will reduce the likelihood of missing a step or an important piece of information about the structural integrity of the tree. Learning more about wood decay fungi identification, and about how decay fungi affects the trees on which you work, are similarly essential components of guaranteeing a safe worksite. Next Steps: Guide your crew in performing a pre-work tree risk assessment. Start with the roots and the trunk, then move up the tree to the main limbs in the inner canopy, and then on to the smaller branches in the outer canopy. Take particular care when looking at the root system. Bring a blunt-tip probe and encourage your crew to practice checking for soft or decayed roots. Don Roppolo is a manager of Arboricultural Training with The Davey Tree Expert Company. He is an ISA Certified Arborist (#IL-1393ATL).